Garred SEE (son of John See and Margaret Jarrett)2865, 2866, 2867, 2868 was born 07 Nov 1785 in Greenbrier Co., Virginia(WV)2869, 2870, 2871, 2872, 2873, and died 09 Jan 1857 in Lawrence Co., Kentucky2874, 2875, 2876, 2877, 2878, 2878. He married (2) Florence Graham GARRED on 06 Mar 1814 in Kanawha Co., Virginia2879, 2880, 2881, 2882. BIRTH / DEATH: "Ancestors of John See", from Beverly Pack, page 2, gives b. 29 Oct 1785 and d. 1 Jul 1857. "Vital Statistics of Lawrence County Kentucky 1852-1907" page 146 says Garred died of "Gravel". FIRST DEED IN LAWRENCE CO. KY. This indenture made and entered into this 25th day of March in the year of our Lord one thousand, eight hundred and twenty-two [ ] Richard Chambers of Lawrence County, State of Kentucky of the one part and Jarrett See of the same county and state aforesaid of the other part. [ ] That the said Richard Chambers on his part hath this day For deed in consideration of the sum of fifty dollars, good and lawful money of Kentucky to him in hand paid by the said Jarrett See before the ensealing and delivery of these presents the receipt whereof is hereby acknowledged given granted bargained sold enforced and delivered unto the said Jarrett See a certain tract or partial of land situate lying and being in county of Lawrence and State of Kentucky and bounded as follows located Beginning at David Jarrett line at the mouth of Rockcastle Creek, thence up said Rockcastle Creek with its meandering to a drain opposite where John Cox now lives, thence up said drain following the right hand fork of the line of the creek land that said Chambers bought of Thos. Price and with said Price's line to David Jarett line and thence with said Jarrett line to the beginning more to have and to hold unto the said Jarrett See and his heirs forever persons whatever, shall will and do forever warrant and the said Jarrett See and his heirs all and singular the aforesaid premaces. In testimony whereof I have there unto set my hand and seal this date above written. I, Joseph R. Ward, Clerk for the court for the county aforesaid do hereby certify that within deed From Richard Chambers to Jarrett See was this day produced to me in my office and acknowledged by the said Richard Chambers party thereto to be his act and deed hand and seal for the purposes therein mentioned, and the same is duly recorded in my office according to law given under my hand the day and date aforesaid. Big Sandy River, some three miles south from Louisa, KY. (Cemetery records). "Jarrett (or Garred) See, born in Greenbrier, in what is now the state of West Virginia, and died in Lawrence County, Kentucky on January 9, 1857. The slab over his grave states that he was 71 years, two months, and two days old. His wife, Flora Jarrett See, was born in Greenbrier County W.Va. May 25, 1795 and died January 6, 1885. They were first cousins. Their marriage license were issued, in the year 1813, and is on record in the Kanawha County Court Clerks' office at Charleston, W.Va.
After their marriage, they located in Greenbrier County, W.Va., where their first two children were born. They then disposed of their farm, selling it to one Conrad Kerrer, and tradition says came to Kentucky and remained only a short time, and then with his parents, and their family moved to Wayne County, Indiana, where their first son John Nugen See was born. Shortly thereafter they returned to Kentucky which was about the year 1818, and settled on a farm which extended from Tug River to the Levisa River, beginning at or near the mouth of Gum, or See Branch some three miles south of Louisa in the Point section. The old home stood for many years on top of the hill, the divide between See Branch and Three Mile Creek. Tradition says that his reason for locating there, was that it was near a "Deer Lick" located at the foot of the hill where much wild game came to get water and lick the salt deposits which came from the water in the spring. It also seems that he owned land on further up Tug River, for it is found that the first deed to be recorded in Lawrence County when it was made in the year 1822 from parts of Floyd, and Greenup County, was a deed from Jarret See, to his brother in law, Richard Chambers, embraseing all of that certain tract of land lying in and around the mouth of Rockcastle Creek, in Lawrence County, Kentucky. this deed is of record in the office of the County Court Clerk of Lawrence County, at Louisa, KY. In later years Jarret See with his family moved to Louisa, and owned and occupied the property on the north west corner of Madison Street, and opposite the C&O Depot, which later became known as the Dr. Sweatman Home. Some years ago the old house was moved to the back of the lot facing Jefferson Street and the Railway to make room for the brick store building which now stands there. The old house in its present location still stands in 1957. In this house their daughter Flora, whom became the wife of James A. Wellman, of Catlettsburg was born. He also owned the lots upon which the Post Office at Louisa now stands. When the County of Lawrence was established, and the Town of Louisa was founded by an act of the General Assembly of Kentucky, it is found that much of the property south of Main Street was claimed by various people who occupied the same and who were without legal title to it. When the site was located for the Lawrence County Court House, the County was unable to secure a legal title to it. It seems that Frederick Moore, a pioneer settler who located in and around Louisa and Fort Gay, had purchased the property and disposed of a lot of it in small parcles making the proper deeds for the same, which were recorded in Prestonsburg, which was the County Seat at that time for all the land south of Main Street in Louisa, Main Street of Louisa being the line between Floyd and Greenup Counties. Prestonsburg, the County Seat, being some forty miles away, was difficult to reach in those days, many of the deeds made to the property later was not recorded and became lost. In order to perfect the title to this property, the General Assembly passed an act to clear the titles and appointed Trustees of the Town empowering them to make good and sufficient titles to the various acre tracts in which the town was laid off. Just who the first Trustees were, the writer has not that information at hand, but we find that in the year 1848, deeds were made to some of the lots and signed by Garred SEE, Thomas Wallace, and Gatter Cushing as Trustees of the Town of Louisa. Garred See, his wife, and most of his children and many of his descendants are buried in the See Grave Yard, some three miles south of Louisa. 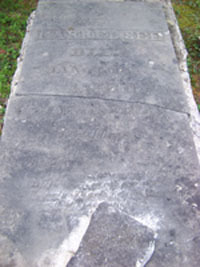 The first of the family to be buried there was their daughter, Margaret See BATES, who died in the year 1847. Over the grave of Garred See, is a large stone cannopy, resting on stone pedistles, and tradition says that he is buried in a stone vault which he cut from the native stone, along with the pedistles upon which the cannopy rests." Fannie See, b. 1820, Lawrence, KY, USA2892, d. date unknown. Felix See, b. 18282892, d. date unknown. Emily See, b. 22 Oct 1815, Lawrence, KY, USA2892, d. 1888, Lawrence, KY, USA2892. Jane See, b. 16 Jun 1816, Lawrence, KY, USA2892, d. 1891, Lawrence, KY, USA2892. +John Nugen SEE, b. 26 Jun 1818, Wayne Co., IN2893, 2894, 2895, 2896, 2896, 2896, d. 01 May 1877, Lawrence Co., KY2897, 2898, 2899, 2900, 2900, 2900. Margaret See, b. 29 Apr 1823, Lawrence, KY, USA2900, d. 1847, OH, USA2900. Michael See, b. 1825, Lawrence, KY, USA2900, d. 1870, Lawrence, KY, USA2900. Elizabeth See, b. 1827, Lawrence, KY, USA2900, d. 1879, Lawrence, KY, USA2900. William See, b. 03 Jan 1829, Lawrence, KY, USA2900, d. 12 Sep 1866, Lawrence, KY, USA2900. Florence See, b. 1834, Louisa, Lawrence, KY, USA2900, d. 1906, Gatlettsburg, KY, USA2900. Garred See, b. 07 Dec 1836, Lawrence, KY, USA2900, d. 1864, Lawrence, KY, USA2900.